Second state of Visscher's superb map from a Dutch Bible. Published by the house of Elzevier and is a good example of the decorative style of Dutch cartography in the seventeenth century. 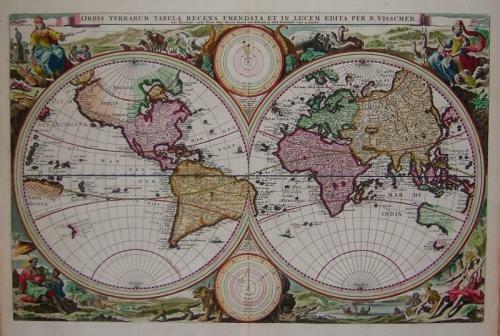 This map is surrounded by rich engravings that include allegorical representations of the continents as well as their native inhabitants and wildlife. Two diagrams depict the Ptolemaic and Copernican theories of the solar system. The northwest coast of North America is greatly exaggerated and shows California as a peninsula. Western Australia, Van Diemen's Land and part of New Zealand are marked.